My kids are loving cooking with me in the kitchen. So I wanted to hunt down an easy valentine's day recipe we could make together. 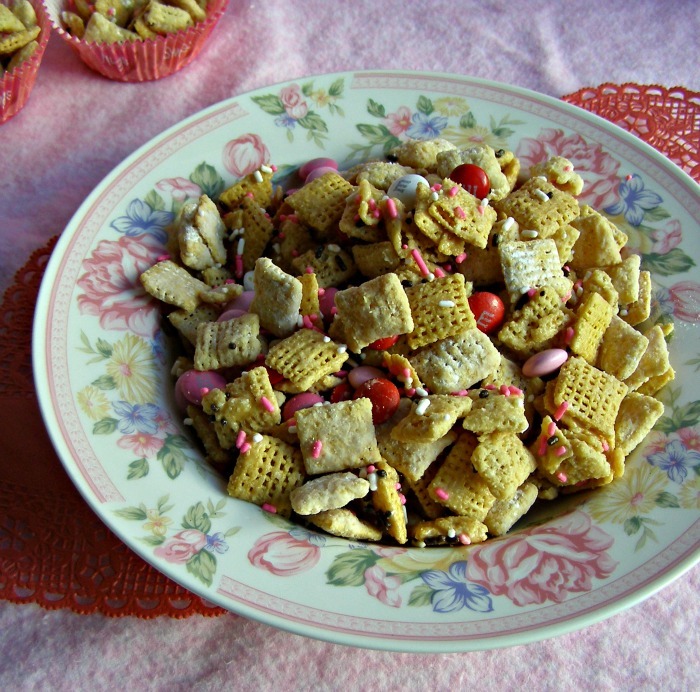 I still have leftover cereal from our holiday Slow Cooker Chex Mix marathons so we made a Valentine Chex Mix to satisfy our sweet tooth. My kids are finally getting to the age where we can cook together without me having panic attacks. The kids still make a gigantic mess, but at least I'm not worried about anyone doing any real bodily damage. We've made sugar cookies together during Christmas and they were more than happy to help mix up some hot chocolate mix. It was time to move on to a snack. This is basically a “puppy chow” type of recipe that uses white chocolate chips instead of chocolate chips. I'm wondering how butterscotch or even cinnamon chips would taste. It's kind of hard to see in my photos, but you only coat half the cereal with powdered sugar to give it a two tone look. That didn't really work for us, but the kids don't care because it tasted good. The batch of Chex Mix lasted about 10 minutes after I fended them off to let me take some pictures. This would be great packaged up and handed out to friends and family for Valentine's Day! Put the cereal in a large mixing bowl and set aside. Melt together white chocolate chips, peanut butter and butter in a small pan over low heat, stirring to combine. Pour the mixture over the cereal in the bowl, stirring to coat the cereal thoroughly. Put half the cereal in a plastic bag. Add powdered sugar. Close bag and shake to coat cereal in the sugar. Add the sugar coated cereal back in to the mixing bowl. Stir in desired amount of M&Ms and sprinkles. 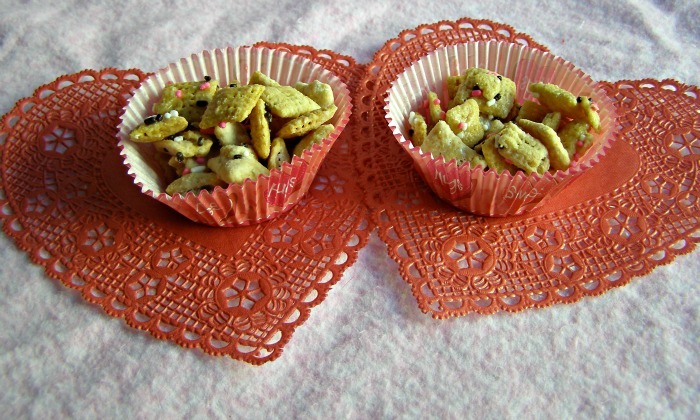 Recipe adapted from Make Chex Party Mix. I could seriously use some of this right now! Would be a good late-night-working snack. Thanks for linking it up at my Weekend Kitchen Link Party! Wow, I’ve never seen pretty chex mix until now! Great recipe! Thanks for sharing at the Loving Valentine’s Day Party! Put this in airtight container? Ours never lasts that long but yes, I’d store it in an air tight container. Hey Camille, do you think I could make it without the peanut butter? I think so. I think the peanut butter is just for taste…. Thanks for a great link up.